Craniopharyngioma tumors are histologically benign, but their management remains challenging because of their intimate relationship to vital neurovascular structures such as the optic apparatus, pituitary stalk, hypothalamus, and vessels of the circle of Willis. Surgery remains the mainstay of suprasellar craniopharyngioma management. Although total resection should be the goal, a subtotal resection with postoperative radiation is a reasonable option if the lesion is adherent to the hypothalamus or other eloquent midline structures. Open transcranial approaches are the standard of care for surgical intervention, which have stood the test of time. More recently, minimally invasive transcranial keyhole approaches and endoscopic endonasal approaches have been added to the armamentarium of skull base neurosurgeons. In 18.2, we discuss the options available for open transcranial approaches to craniopharyngioma tumors and consider their relative merits and limitations, patient selection criteria, perioperative care, complication avoidance, management principles, and surgical outcomes. No single operative technique can be considered as the “best approach” for all patients. Each patient is best served by the formulation of an individualized, tailored surgical plan that aims to realistically and safely achieve the expected management goals. The supraorbital “eyebrow” craniotomy is an ideal approach for those tumors that are anterior or superior to the optic apparatus, and we discuss this in 18.3. Meticulous attention to detail during the approach and tumor dissection as well as the closure will help achieve good tumor resection, minimize morbidity, and maintain cosmesis. The use of surgical tools such as the micro-Doppler probe and neuroendoscopy are helpful to visualize and preserve critical neurovascular structures. Attentive postoperative management is necessary for good long-term outcomes with close monitoring and treatment of endocrinopathies. The use of stereotactic radiation therapy and targeted molecular therapy should be utilized as necessary. Recently, there has been increased application of the endoscopic endonasal approach for these tumors. 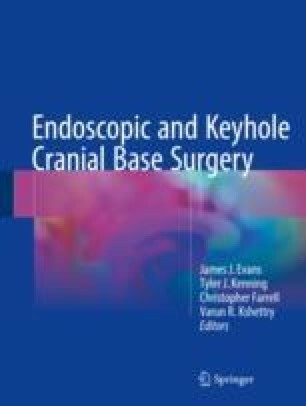 In appropriately selected cases, the endoscopic endonasal approach offers excellent direct visualization of the undersurface of the optic chiasm and its vascular perforators, hypothalamus, and third ventricle, which contributes to safer microdissection and a more complete removal while minimizing potential complications. In 18.4, we review the technical nuances and surgical pearls for resection of suprasellar craniopharyngiomas using the endoscopic endonasal approach. We also discuss factors involved in approach selection and complication avoidance.